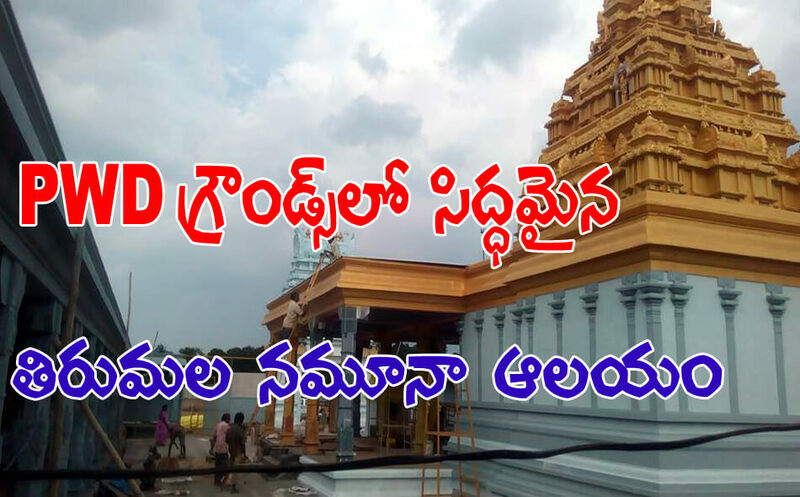 Tirumala replica temple which is going to come in PWD grounds at Vijayawada, for Puhkaram pilgrims is almost ready. The temple would be ready for people from August 7th. The Tirumala Tirupati Devasthanams (TTD) is geared up for providing darshan to one lakh devotees every day. All the arjitha sevas will be performed in ekantam and the temple opened for darshan from 4 a.m. to 10 p.m. Unjal Seva will be performed every day between 7 p.m. and 8 p.m. The devotees would be given pocket-size photos of Lord Venkateswara Swamy and prasadam. Fruits and flowers Exhibition, a photo expo and Ayurveda and books stalls would be added attractions. The TTD is making arrangements for the pushkaram at a cost of Rs.7.50 crore. It has deployed 650 employees and will press more than 1000 volunteers into service.